I can't overemphasize the importance of making sure every cover letter you write looks professional and serious. Folks, here's the plain truth... your resume cover letter can make — or break — your job search efforts. You simpley HAVE to master this part of the equation, or you won't get the jobs you want without a lot of dumb luck. 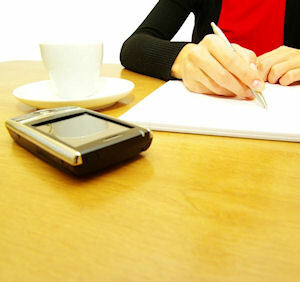 Using the right cover letter format is part of it. Don't just dash off a letter on your laptop and send it off. It takes a little more effort than that. You can use the cover letter formatting tips below to make sure you won't go wrong! Your resume cover letter should be laid out like a typical business letter, rather than a personal letter. The easiest thing to do is to download one of our cover letter templates (Word format) and customize to suit your situation. Many resumes and cover letters today are emailed or faxed. In those cases, paper is not really an issue. But if you do snail mail your documents – or hand them out at a job fair – then it's important to use good paper. Paper comes in different weights; 24-pound bond is best for this purpose. For color, stick to white, cream, or possibly a very light gray. Spacing between your return address and the address of the person you're writing can vary from 2 to 6 spaces, to best center your letter on the page. Use three line spaces between your closing (i.e., "Sincerely" etc.) and your typed signature. Or, leave four spaces if your handwriting is large. This is where you'll hand sign your letter, so you want to leave enough room to write your name comfortably and legibly. Margins also help to make your letter look balanced on the page. For best results, use equal top and side margins, with a bottom margin that is a bit bigger — about one-and-a-half times the size of the other margins. So, if you use 1-inch margins on the top, right, and left side, then use a 1.5-inch margin on the bottom. It's best to use the K.I.S.S. 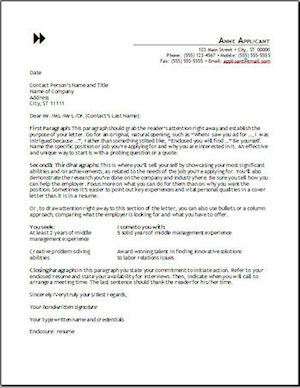 (keep it short and simple) principle with a resume cover letter format. Try to keep your resume cover page to one page in length. The key is to grab the recruiter's attention, in a clear and concise way. If the letter is too long, you may lose the reader's interest. If you must write a long letter to convey all you need to, then be sure to put your most important information up front. If you prepare your resume cover page using the resume cover letter format tips outlined here, you'll have a nice-looking letter to go with the resume you've worked so hard on, guarantee you.